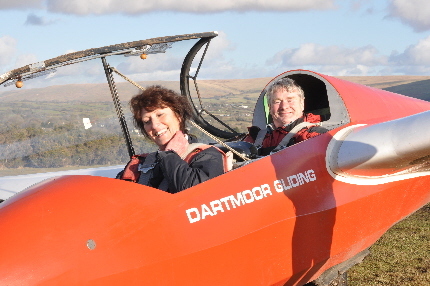 The aim of the One Day Introductory Course is to give participants a better understanding of gliding than they would get from a single trial flight. The idea is to encourage them to continue training and go on to fly solo. At the end of the course students receive a training record card and completion certificate. The intention is to complete the course in a single day, although occasionally weather constraints may mean a return visit is required. The modules will provide sufficient knowledge for the participant to have a good understanding of flying techniques and the routine operation of a gliding airfield. Six flights will be made in a two-seat training aircraft with an instructor qualified by the British Gliding Association. Prior to the first, the student will receive a pre-flight briefing that includes an explanation of safety features and pre-take off checks. During the first flight the effects of control surfaces – elevator, aileron and rudder, will be demonstrated with the student ‘following through’ on the dual controls. Subsequent flights will involve the co-ordination of turns and flying the glider properly ‘trimmed’. There will also be an opportunity to study approach and landing techniques. Between flights there will be briefings on airfield procedures and demonstrations of glider launching and retrieving. Gliding is a fun sport that can be enjoyed by almost anyone, but participants are required to declare they have no medical condition that would preclude them from flying. Courses are run throughout the year, so weather conditions can vary. It is advisable to bring a fleece or sweater and to wear stout shoes – but not heavy boots! Tea, coffee and biscuits will be provided in the clubhouse but participants should bring a packed lunch. An Introductory Course costs £185 (£155 for Juniors). To book or request further information please click here. Completion of the course entitles the participant to a substantial discount if they sign up for a ‘Fixed Price to Solo’ training course at Brentor within the ten days following. Pre-course training material is available on this website.